What’s the Difference Between Cosmetic Surgery & Plastic Surgery? It may come as a surprise to some people that there is a difference of cosmetic surgery and plastic surgery. The two terms are not synonymous, even though they are often interchanged. Cosmetic and plastic surgeons go through different training and perform different procedures, which may be a vital part of your decision when choosing a surgeon for a cosmetic operation. Cosmetic surgeries are elective procedures that are done for aesthetic purposes, giving an individual a more “perfected” look with improved symmetry and proportion. Plastic surgeries are performed to correct, or repair a part of the body that is not functioning properly. Plastic surgery is often done to correct birth defects or deformities resulting from trauma. Is the Training the Same? Both surgeons must complete medical school and a residency, however there are not any specific cosmetic surgery residencies. 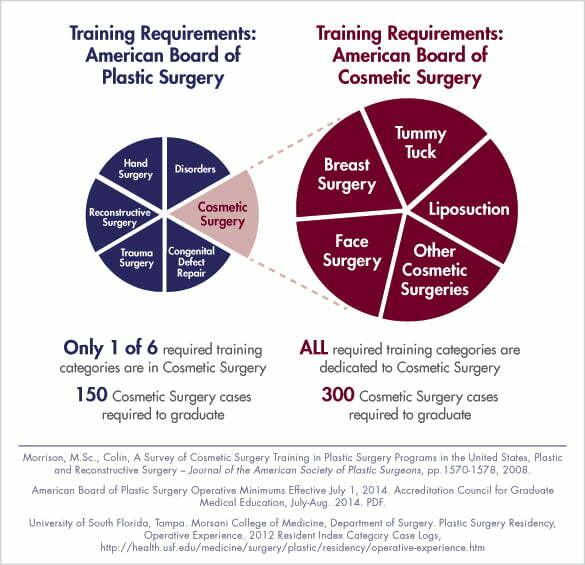 Doctors looking to specialize in the cosmetic field choose to undergo an additional cosmetic fellowship program to gain an expertise in cosmetic procedures. If you are looking to have an aesthetic or anti-aging procedure done it is very important that you find a doctor that has completed additional training on the area you wish to alter, much like Dr. Andre Berger. What Should You Pay Attention to when Choosing a Doctor? The process of choosing a doctor should be based on three things: What is the purpose of your surgery, what kind of education has the doctor had, and is the facility they operate in an accredited facility? When doing your homework on a doctor be sure to look at their websites for before and after pictures, patient testimonials and even talking with people that have been treated by that physician to hear about their overall experience can be very helpful. Each state has a Medical Board who licenses and keeps physicians accountable in their practice. You can often see a listing of your state’s doctors and what they are licensed to practice online. If you’re interested in learning more about physicians in your area, contact your state’s Department of Health or Medical Board or visit www.fsmb.org for a full listing of Medical Boards by state. Why Dr. Andre Berger and Rejuvalife Vitality Institute? Dr. Andre Berger is the founder of the Rejuvalife Vitality Institute and a cosmetic surgeon with 35 years of practice experience. He also is associated with several prestigious medical academies and organizations. He specializes in medical management, internal medicine, clinical pharmacology, nutraceuticals, emergency medicine, cosmetic surgery, cosmetic medicine, anti-aging and regenerative medicine, and functional/holistic medicine, making Rejuvalife your one-stop place for all of your cosmetic, health, and wellness needs. Learn more about Cosmetic Surgeon Dr. Andre Berger. If you are in the Los Angeles area and are considering a cosmetic procedure, call us today at 310.856.9173 to schedule a consultation in our Beverly Hills, CA office.